← The Nautilus Swell has taken on the reputation of cookie wrangler! The water gradually turned a milky green and white specks appeared in the distance. I looked up as I was doing breakfast dishes and saw a big, white shape go serenely by, a smallish iceberg meant we were nearly at anchorage. This is my second year aboard the Nautilus Swell and it would have been my 3rd time to LeConte Glacier. I promised myself I would never, ever turn down an opportunity to go serve guests drinks chilled by glacier ice in the extremely picturesque fjord; but after seeing Chef Tim’s eyes light up at the preposition from Captain Tim that I stay behind and make lunch while Chef Tim take my place on Inde, I couldn’t imagine denying somebody else that marvelous experience. It was Divemaster Jesse’s first time as well and he had stayed up all night making sure his Go Pro was ready to capture his and the guests experience jumping and lounging on icebergs. I felt a prickle of jealousy as everybody suited up but I also was excited to try my hand in the galley making lunch for everyone. I decided on my Mexican mother’s traditional family recipe for tortilla soup, my good friend Hersan’s recipe for Gallo Pinto that I learned while living in Costa Rica, Enchiladas in red sauce, spicy cinnamon, cayenne, double chocolate cookies and a fresh green salad. I had four hours to clean all the rooms, do a towel change and make lunch! I set off at a frantic pace. 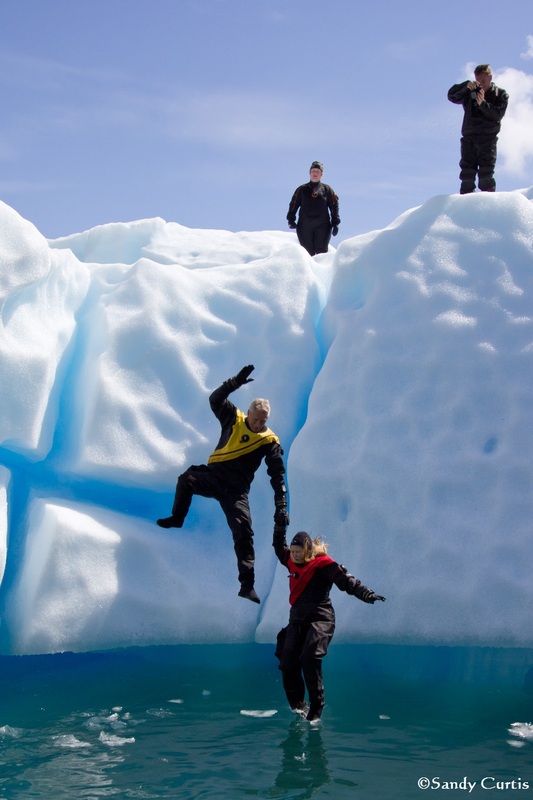 With much help from first mate Ron, we got everything done just in time for the arrival of the iceberg conquistadors who bounced back onto the boat all smiles and glowing with the beautiful sunny day that had emerged from the clouds for a spectacular ice day. I served lunch with a new found respect for Chef Tim who cooks 3 meals a day for these ravenous adventurers who daily, brave deep, cold water to see new things and come up with a hearty appetite! It was lovely to return to your delicious food after playing in the ice. And both chef Tim and dive master Jesse were fun companions.